Every day he survives without being eaten all up by his own mother is a miracle. The adorable brioche vest he’s wearing deserves better than a wimpy phone camera, but that’s what was within reach when opportunity knocked. It was concocted by my friend Jen from yummy Blue Moon Mopsy and it couldn’t be toastier. I wish it fit me. And it’s just the right garment now that the mornings are crisp and cold. These October days we are all awake before dawn. I bring the little fellow into our warm bed for the first feed of the day, curling around his small sturdy body, hoping he’ll doze off again and we can all close our eyes for a few more minutes before the clamor begins from his sister downstairs: “I like walk through dis gate right now! I like eat some food!” But often I catch the gleam of his wide eyes seeking mine in the darkness; he is awake, and he knows I am awake, and he celebrates this simple discovery with much pedaling of legs and the performance of many songs of his own composition, songs to do with milk and moonlight and the felicity of suckable fingers. In another time or another place I’d have to be out of bed in the early dark, stoking a fire, drawing water, struggling to drive the cold out of our home and bring forth some sort of breakfast before the rest of my people woke to the day’s work. It’s a luxury to savor a sweet baby snug in my nest at a quarter to six. If only I were virtuous enough to remember this before I’ve had coffee. Yes! You are quite wise. A grandma who wishes she had spent more time feeling grateful when her own kids were babies. Keep writing down the toddler speak – I am surprised how little I can recall. As for the smaller baby in bed – that I do remember…. Your sweet words really made me smile today. Thanks. I love your vignettes of motherhood. They really showcase the sweetest portions of life. Last night we got “Your noodle fall out your orange bowl!” Seven words in a row seems like so very many!! Your little one is such a handsome fellow!! Miss you all. Funny, my little baby is now about the age of your big girl. Stella is 21.5 months or thereabouts. Time flies. I still breast feed her (less often of course!) so I relate to both your children’s goings-on. A couple of weekends ago Stella said, “I love coffee!” Yeah, her language skills are good! He s gorgeous ! Very like his sister too. 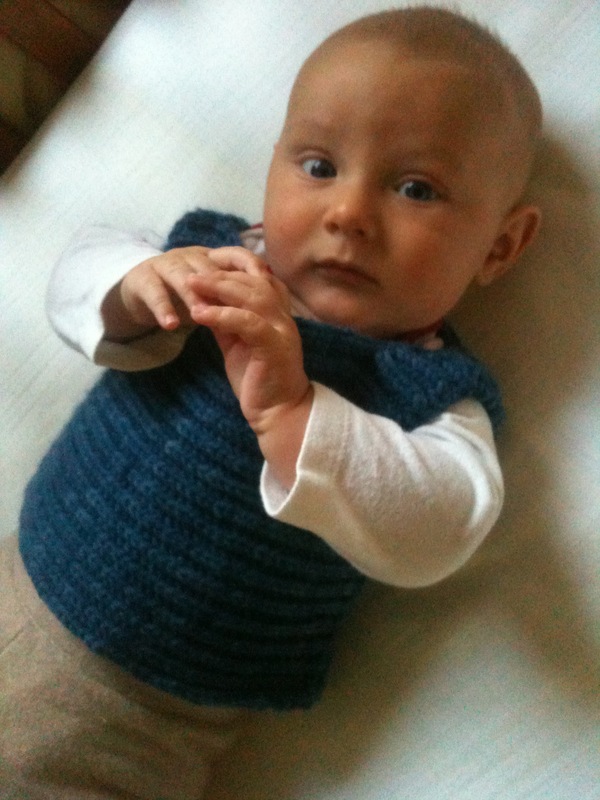 LOVE the vest – I have made many for many grandsons but none as pretty as that one. He looks as if fully expects a steady supply of hand knits. Their first sentences are so sweet – you remember them all your life ! what a dapper, self-possessed little fellow! all those nocturnal moments are my favorite, if i’m being honest, when all the rest of real life is at rest. He looks like he’s got his ph.d already! That is some baby boy in some vest! Do not part with this picture. I see that you haven’t added much since 2013 and I can only imagine how much the little ones have grown. Knitting blogs are always interesting to me and I decided to (wo)man one of my own. My knitting seems to be slower because I usually am knitting sweaters, with long sleeves. Takes forever. I live in the No Clack area (by Happy Valley) and am semi-retired and training a Dachshund how to behave in a house. She’s a good little girl from the OHS. We got her on a Tuesday and named her,”Ruby”. My days are spent gardening, knitting and catching up on programs online (we don’t have cable) and walks with Ruby. Are you still knitting/blogging? I think your red sweater is quite smart looking. Eileen, I’m at whistlinggirlknits.com nowadays! Come on over!